HPM caters extensively to the needs of the domestic market. High domestic demand potential drives us to raise our bar at frequent intervals. 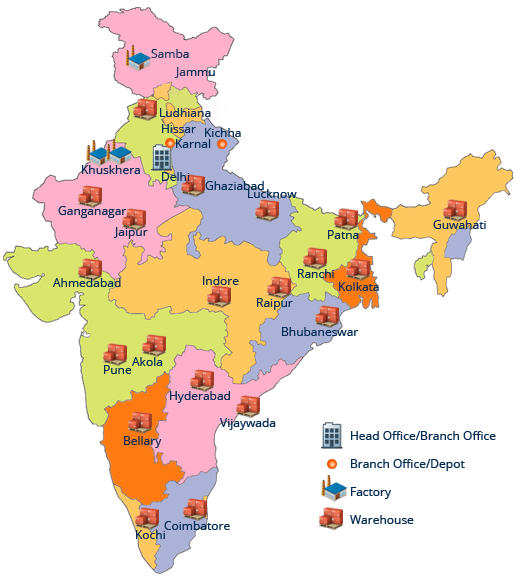 We have been growing extensively to ensure the ease in business transaction across states. Our extended supply chain is managed by an effective networking mechanism. A well premeditated exchange between warehouses, distributors and end users is ensured at all times. A robust liaison between all the Indian states including 7 lakh villages and 593 districts. An effective networking between 4000 distributors, 16000 dealers and 40000 retailers to facilitate smooth processes. Benign and ever expanding chain of warehouses spread across every state to aid the reach of supplies.